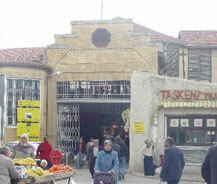 Visit the covered municipality market - Belediye Pazari ('Bandabulya') in the old city. This is where you would find everything from fresh groceries, koshery, turkish delights, to bath products, traditional ornaments, etc... And for the most reasonable price. Just be careful and bargain with the shop-owners. Operating hours: Mon-Fri 6am-3pm, Sat 6am-1pm).